On October 12, Ambassador Liu Xiaoming met at the Chinese Embassy with Mr. Martin Roth, the new Director of the Victoria and Albert Museum, and Ms. Beth McKillop, Executive Deputy Director of the Museum. Ambassador Liu congratulated Mr. Roth on his appointment as the Director of the well-known British museum. 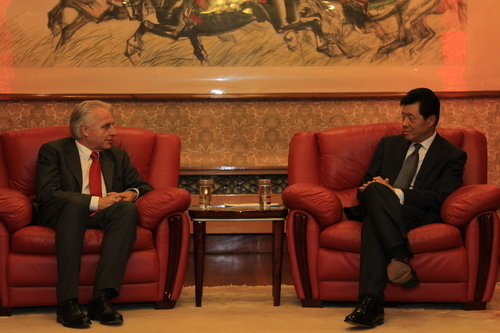 He pointed out that the China-UK cultural exchanges have great potential. During the visit of Premier Wen Jiabao to the UK in June, the two sides announced to set up a mechanism for human and cultural exchanges. Increased exchanges between the people of the two nations will contribute to a better China-UK relationship. The Western countries still have a lot to learn about China's great achievements in its over 30 years of reform and opening up. British museums are large in number and have rich resources. They have held many exhibitions on the Chinese cultural relics, but the exhibitions on the contemporary China are rare. Ambassador Liu hoped that the Victoria and Albert Museum would continue to play an active role in this aspect. Mr. Roth agreed with Ambassador Liu and said that the Victoria and Albert Museum attaches great importance to the friendly exchanges and cooperation with China and is willing to hold more exhibitions on China, including the contemporary China. Founded in 1852, the Victoria and Albert Museum is one of the most important national museums in the UK. It has a diverse collection of about 3 million pieces, of which 15,000 are Chinese artworks.